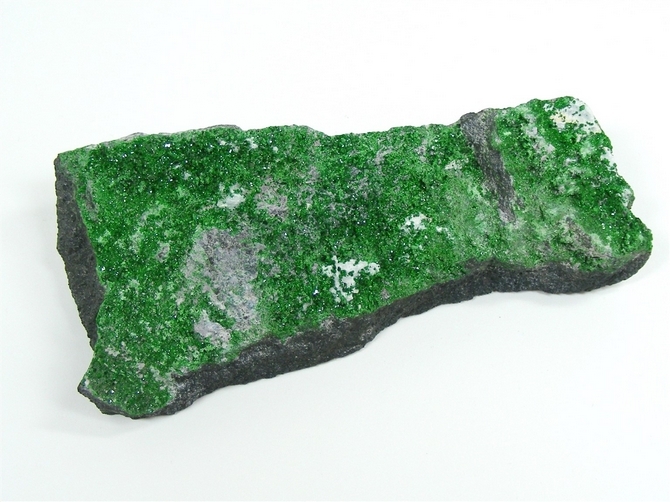 Uvarovite is by far the rarest member of the Garnet family. The bright green colour is due to Chromium within the crystal structure and this gives it the alternative name of Chrome Garnet. 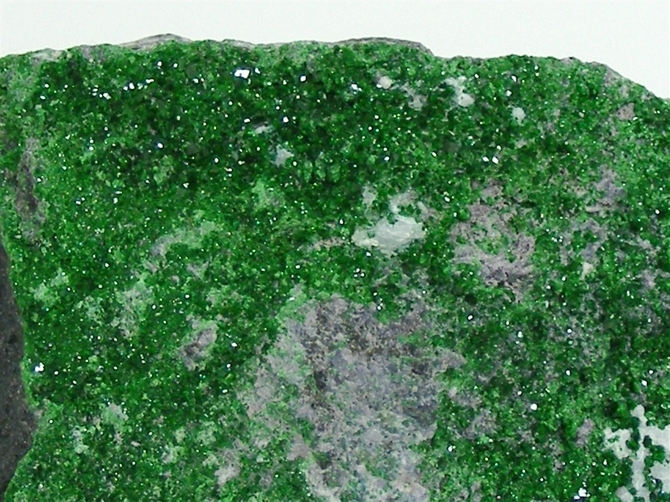 Because most Uvarovite is found in Russia, it is also called Russian Garnet. 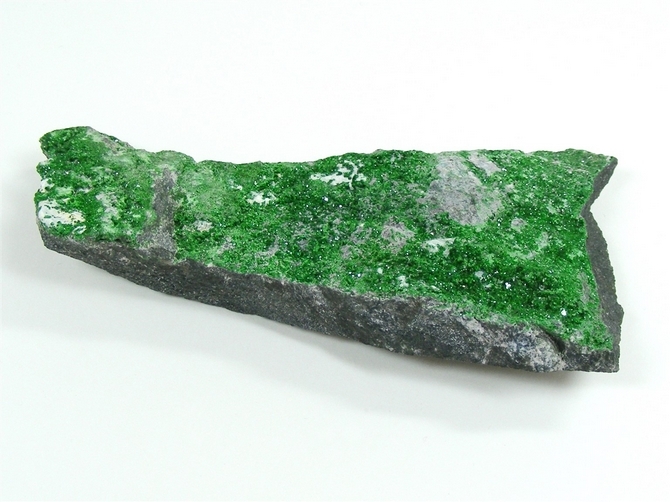 Actual crystals of Uvarovite are exceedingly rare and most pieces found are exactly like this one, a druze formed over pre-existing rock. This piece is a good large size and has a gorgeous colour and a lovely formation. Nice emerald green colouring and a great size to work with. Excellent example of this rare Russian stone. 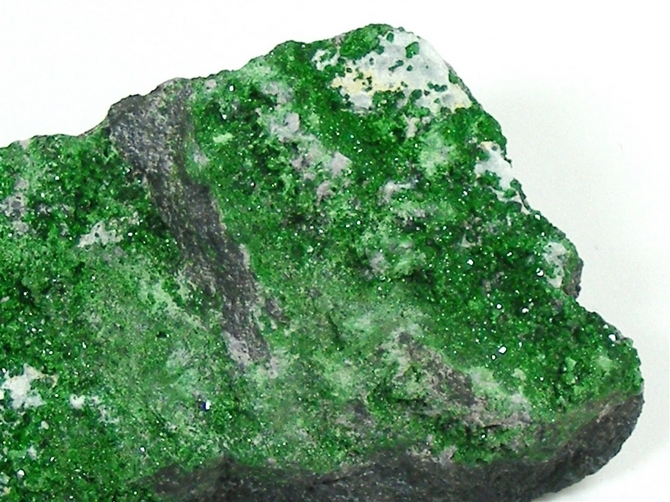 Uvarovite, a rare form of Green Garnet, is believed to assist in the removal of toxins from the body and is thought to be useful in treating disorders of the heart and lungs. It is also thought to be beneficial when receiving treatment for leukaemia, kidney problems and bladder problems. Uvarovite is also useful in addressing problems around sexual dysfunction. 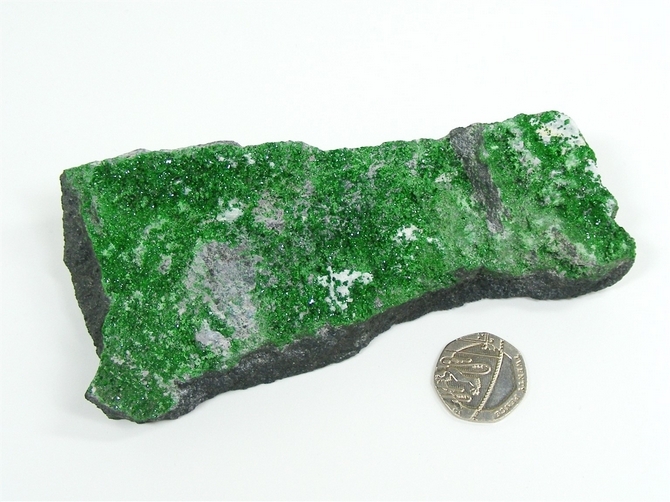 Uvarovite can be an excellent healer of emotional problems as it helps to release old emotional traumas and can also provide us with a way of accepting things that have happened in our past. It can promote mental clarity and it instils a sense of peace, quiet and solitude. It can also enhance relationships by helping two people – or indeed, a group of people – to "come together" with a single more focused thought in mind. An excellent stone for healers to work with as it will keep negative energies at bay. It can also help us to better recognise the never-ending and eternal nature of our soul.